What is important is that a Veteran does it, just as one spoke to me more than 50 years ago. It’s the connections I represent that are really the key to my talk tonight. So I want to tell you some stories. Many Americans, outside this room tonight would not understand because they have had little personal contact with the military and war. Today, it is estimated that less than 1 percent of the American people serve or are associated with the military. So in the minds of most Americans being in the military is a foreign thing. They truly have no idea of what we as members of the Armed Services have done for our nation. Combat is even more remote. War has not touched most Americans lives since Vietnam. After all, in many people’s mind, war only happens to others. Today in Afghanistan: It is the soldier’s war. It is not the ordinary American citizen’s war; it is not their experience. It is only when war intrudes into a person’s life that this experience changes. And war does intrude into lives. And that is my first story. My Uncle Harold was a private in World War II. His story in many ways is very similar to the one depicted in the book and TV series – Band of Brothers. He went through basic training in the south, was assigned to the infantry, and was shipped overseas where he immediately found himself in the Battle of the Bulge. Today historians characterize the Battle of the Bulge as one of the most brutal episodes of the Second World War. The Americans who fought at the Bulge were ill prepared for the rapidly approaching winter weather. The operational planners thought that they wouldn’t need winter gear as – the war would be over soon – THE WAR WOULD BE OVER SOON – let that sink in for a moment. This is a common phrase from every war in history. Funny that is not the way things work out. During the battle, the push toward Berlin was stalled by the last German offensive of the war and in the end more than 20,000 Americans died. My uncle never talked about this experience even to the end of his life, all I knew was that he had been at the Bulge. April 1945 – As we pushed through Austria we were notified that there were two German Concentration Camps near by. The two concentration camps turned out to be Gusen and Mauthausen. They contained about 2500 prisoners held by the Nazi’s. My unit arrived at Mauthausen the day after it was liberated by the Third Army. All around the camp was a high electric fence. In the camp and on the road were many people, men, women and children waiting to be picked up and sent to hospitals for treatment. All were in very poor health and looked starved but so happy to be rescued. Down below we saw a brick building with two high smoke stacks. Mauthausen was a death camp. The ovens had been working 24 hours a day but could not keep up. There were piles of bodies along the road out side. Action had to be immediately taken to restore order in the camps and to provide medical assistance to the starving inmates. Conditions were beyond belief and we did every thing possible to help these poor people. In the end my uncle was not only a brave soldier who survived a terrible battle, but also a man who helped to save many lives. To him I say well done. Next I want to share the story of Major Ted Shorack. Ted was one of my ROTC instructors at Hobart in the 1960s. If there were ever a man who exemplified what it meant to be a good officer it was Ted. He had the military bearing and positive attitude that motivated young men. Ted was approachable and often counseled all the Hobart men who went to him for advice and help, whether they were in ROTC or not. Further he was active in the Geneva community and well liked by his neighbors. One of his neighbor’s sons remembered flying with him. He wrote: My parents were friends of Ted and Elva Shorack. My older brother and I remember him fondly as he gave us our first airplane ride. I was 10 at the time. He took us to the local airport and rented a small plane and took us around the pattern a few times. He might as well have hung the moon in the sky for me. Ted had flown the F-84 and the F-101 fighters. He was a pilot’s pilot. And more importantly, Ted led by example. As the Vietnam conflict heated up, he volunteered for service there. Ted left Hobart in the fall of 1965 to fly missions in the A-1 Skyraider in South East Asia. The following year I was set to graduate on June 12, 1966. On June 9, 1966, we received the news that Ted had been lost when his plane went down over North Vietnam. To me his loss brought home the realization war could touch ordinary lives. Ted had been a mentor to me. He had given me confidence in my abilities and encouraged me to pursue a career as a pilot. It was because of Ted that I decided to make the Air Force a career. Today I often think of Ted and say well done. Well, my entry into the Air Force was not without some bumps. I had received permission to go to Syracuse University for my master’s degree, but during graduate school my vision had deteriorated and I could no longer qualify for any type of flight training. So when I went on active duty – the Air Force assigned me to a Security Police Squadron in Washington DC. This to my surprise turned out to be the Air Force Honor Guard. The Guard serves at the White House, Arlington, the Pentagon, and at all major US ceremonial events. So I was assigned to the Air Force Honor Guard for about …..15 minutes . Why you may ask, – well – members of the honor guard are very, very – TALL And you may have noticed: I am not. So I became an operations planner and worked in the command post on the base. After after three years writing operations plans, it was time to move on. By 1971, the Vietnam War was needing more and more aircrews and I found that I could again qualify to fly. For me that meant going to Air Force Navigator Flight School, earning my wings and being selected to fly the F4. After Nav School in the fall of 1972, I arrived at Luke AFB outside Phoenix to upgrade to the backseat of the F4. The F4 Phantom II was the primary Air Force fighter of the Vietnam War. It had entered the inventory in 1960, so in 1972 it was relatively new. It was not a small fighter, it had two big GE J 79 engines that could blast it off the deck and the bird could weigh in at nearly 60,000 lbs when fully loaded with fuel at take-off. When the afterburners were cooking, the thrust was its biggest advantage, it could push you out there away from an enemy or help you engage him in combat. I have to tell you, I fit the F4 perfectly, it was where I was meant to be. The cockpit was very small and so tight I could hardly move. I had on a G Suit to handle increased G forces, an oxygen mask, and was tightly strapped to a rocket ejection seat. 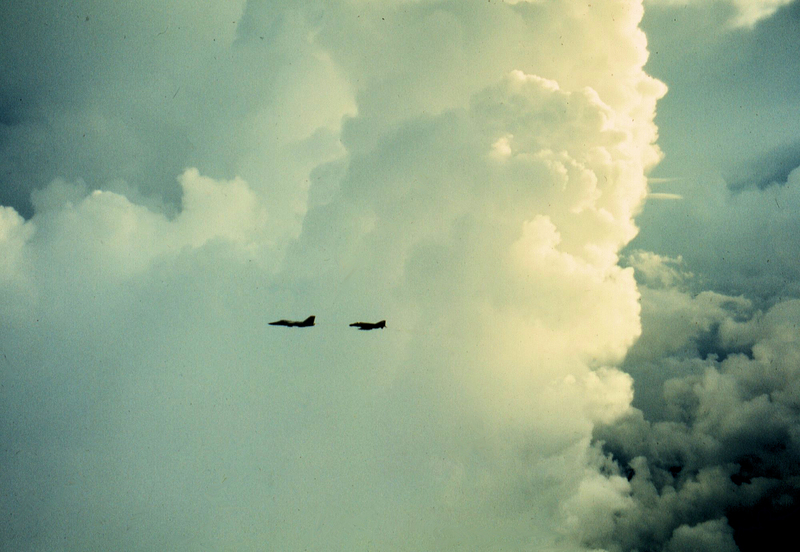 As a Weapons Systems Officer – a WSO in the backseat, I didn’t fly in an F4 — I Wore it. Which brings me to my first flight. Our F4 taxied out of its parking space and slowly moved into position. I wasn’t excited or even nervous – actually I really didn’t know what to expect – I just did what I was trained to do. Now on the runway, the pilot pushed the throttles into afterburner, and released the brakes. With a ROAR of those two big engines, the Phantom accelerated rapidly off the runway. To me, in the back, it was like being shot out of a cannon strapped to the shell. To understand how this affected me, you need to know that the T-29 – a propeller powered trainer I had learned on, cruised at a speed only slightly faster than the F4 took off. So I was playing catch up right from the start. But as we approached our training area, things finally began to settle down. Once there we did maneuvering and I learned how the radar operated on real targets. I tried to sound confident – but, to be honest it had never dawned on me that I would be flying the bird on any mission let alone the first one. Here I was a kid from a rural upstate New York with my hands on the stick of a top-level Air Force fighter. Its hard to put into words my feelings of that moment, now 45 years later. It was mixture of pride, awe, excitement, and an extreme adrenaline rush that lasted well into the night (as my wife can still attest). Over the years I would have The Stick on almost every mission. And from May to August 1973, I would fly combat missions in South East Asia. It was in South East Asia that Ted Shorack’s war would become mine. In the spring of 1973, Congress had mandated the end of all air combat missions on August 15th. That day over Cambodia, as a member of the 13th Tactical Fighter Squadron, I flew on the last F4 fighter combat mission of the Vietnam War. It had not been planned that way. As the end of combat approached, a lottery was held among the colonels in Thailand to see who would fly the official last mission of the war. Our crew, two lowly captains, was on alert that morning and after the “official last fight” had taken off, we scrambled at about 10:30 a.m. and dropped our bombs just before noon. At noon, combat missions ceased and the war ended. We thought, what does that mean, wondering if it was a coded message announcing the end of the war. Then we heard the sound of a toilet flushing. Today I salute those men who flew those missions so long ago and say well done. So that in the end is what I want you to remember, when you have long forgotten who spoke here tonight, I didn’t tell you some old war stories. I told you how I gained confidence in my abilities to do my job and in the end participated in a historic moment. I told you about Ted my mentor and friend who made the ultimate sacrifice for our nation. I told you about my Uncle Harold, a WWII vet who had experienced some terrible and amazing things that most Americans never will. You know those men and women of the second world war were called the Greatest Generation and in many ways they were. But I like to think that all veterans and members of the Armed Forces on active duty now are the greatest members of their own generations. So in closing I ask you – all the Veterans and members of the armed forces here tonight to stand and receive the thanks of your fellow Americans. And I say to you “Well done” – Well done Indeed. This entry was posted in 13 TFS, 43 TFS, Air Force, American History, Bolling AFB, F-4 Phantom II, F4 Phantom II, F4 PhantomII, Family History, Fighter Aircraft, Mauthausen-Gusen concentration camp, New York State History, Norvell Family History, Ontario Co, Thailand, U Dorn RTAFB, Udorn RTAFB, Veterans, Vietnam War and tagged Bolling AFB, Cambodia Bombing. Bookmark the permalink. John from another F4 jock who was a pilot during my tour in 1968 out of Da Nang. This old Gunfighter salutes you. A year ago I had the honor of being the first speaker at a dinner honoring veterans at our local college, As we approach Veterans Day this coming week, I share my talk again — it is good to remind folks of the sacrifices we made and remember those who mentored us.